After two weeks of hard work, the 79th General Convention is now concluded. The legislative session for the House of Deputies ran from 8:00 AM to 1:30 PM, with votes on 29 pieces of legislation…our fastest pace yet. There are several reasons that voting goes so quickly on the last day. First, every piece of legislation has already been approved by the House of Bishops, so it probably makes some kind of sense. Second, if we amend a Resolution and pass it, it then needs to go back to the House of Bishops. If there isn’t time for that, the legislation goes bye-bye. Finally, we’re all quite ready to go home. On an average day in the United States, 96 people are killed by gun violence. Ninety-six people. Dead. Every day. Due to gun violence. Every morning approximately 15 minutes prior to the start of the Legislative Session, Bishops involved in the “Bishops United Against Gun Violence” have held a short prayer service for anyone choosing to participate. They hand out 96 crosses, representing each person that will be lost that day. I attended that brief prayer service this morning, our last day of General Convention. I found it very moving, distressing, and sad. Suicide, urban shootings, police shootings, accidental shootings, and other situations - it brings tears to my eyes. 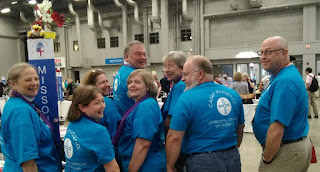 One of the highlights of General Convention has been the re-admission of Cuba as a Diocese of The Episcopal Church. Cuban priests have struggled bravely in a country that officially hated religion and their church flourished despite persecution. As a consequence of Cuban law and of the country's poverty, they have no retirement funds. The Episcopal Church is working with the Church Pension Fund to build them retirement accounts where none existed previously. If you can, please go to www.gofundme.com/cuba-clergy-pension-fund and make a small donation to help build a nest egg for our brothers and sisters in the Cuban Episcopal Church. I verified the campaign and everything donated will go to their account at the Church Pension Fund. 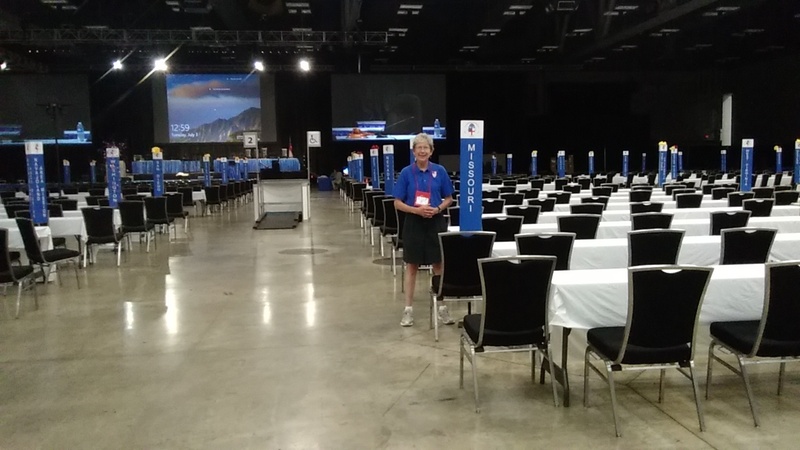 We’re in the home stretch now…tomorrow is the final day of General Convention. Predictably, the day was almost entirely taken up with legislation…seven hours and 45 minutes’ worth. We did get a lot done. We voted on 24 pieces of legislation and a bunch of amendments. Doing a bit of math, that’s three votes each hour. Legislation that’s already been approved by the House of Bishops comes to us for concurrence, meaning that we’re agreeing with them to approve it. Recall, if you will, that every piece of legislation has to be approved by both houses in the same form. Some pieces of legislation were being heard for the first time, so they will have to go to the Bishops tomorrow…or else fade into the legislative ether. So…what did we vote on? When the calendar for General Convention is published, one day stands out because it’s the day when legislative meetings are scheduled to run late. Really late. Yesterday was that day. The Deputies of GC79 are now in our 7th day of business; two more marathon days of Legislative sessions remain. A trickle of Resolutions hit the floor on 5July, by 8July the Consent calendar "was our friend", and it was just announced that a 2-hour reserve session this evening has been triggered. 18 hours of Legislative work remains upon conclusion of the 5:30 worship service! Today was a fairly quiet day, but it’s mostly the calm before the storm. Tomorrow we have a lot of time set aside for legislative processes. Today was “camp day” in the House of Deputies. Each diocese was encouraged to wear a t-shirt from its camp. 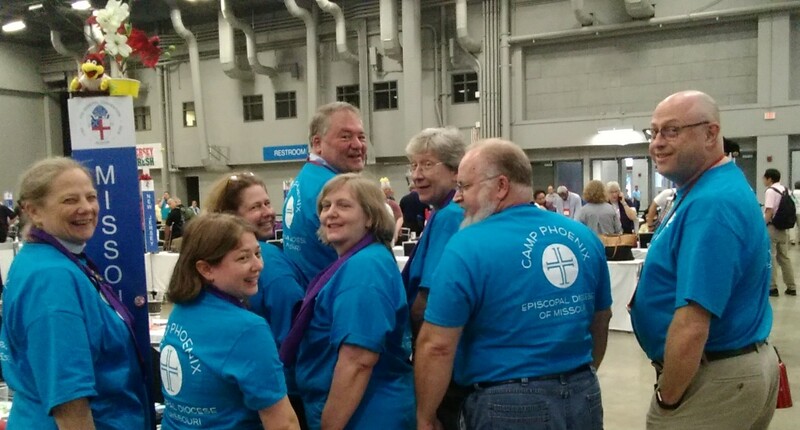 We were all decked out in the beautiful shirts from Camp Phoenix. From left to right: The Rev. Tamsen Whistler, The Rev. Beth Scriven, Kathy Dyer, The Rev. Todd McDowell, Betty Bowersox, Lisa Fox, The Rev.Mark Sluss, Michael Booker. We also wanted to show off the back of our t-shirts. From left to right: The Rev. Tamsen Whistler, The Rev. Beth Scriven, Kathy Dyer, The Rev. Todd McDowell, Betty Bowersox, Lisa Fox, Michael Booker, The Rev.Mark Sluss, Michael wins the prize for being the only one who successfully showed his backside the back of his t-shirt. Stop the World. I Want to Blog. Each day of General Convention, I make note of at least two (and sometimes several more) things about which I want to write to you. But our days are very full. And they are long. My day typically begins with a 7:30 meeting, and usually doesn’t end ‘til 10 p.m.(or later, by the time we Deputies finish talking/debriefing together and talking about upcoming legislation). By the time I return to my room, I am too whooped to write coherently. I give thanks to Deputy Booker for his informative and fun posts. As soon as I can, I will write more. I wish I could carve out more time to write. Well, things are starting to get interesting here in Austin. My day started with a meeting of my committee (Committee 19: the Legislative Committee on Ecumenical and Interfaith Relations). One thing I really like about the committee is that the 28 of us (7 bishops, 13 clergy, 8 laypersons) are all quite passionate about the subject and we really agree on what we’re trying to accomplish. Our disagreements are about how to best do our work, not about the ends we hope to achieve. There’s a strong sense that we’re all pulling in the same direction. That is not true of all committees at General Convention. some of my fellow Episcopalians. It creates some anxiety in me, too. The discussion in the House of Deputies was thoughtful, calm even when passionate, diverse, and wide ranging. I learned a lot during the 90 minutes we spent discussing this important resolution to launch into a revision of our beloved BCP. We will pick up debate Saturday and probably vote on Saturday, too. We Deputies have had a chance to sample a few of the culinary flavors of Austin – but very few, given our schedule of meetings, hearings, and legislative sessions. 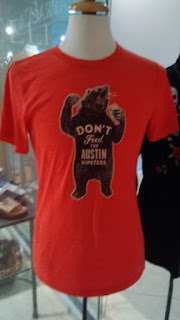 But we are getting a "taste" of Austin's culture. I am amused by the t-shirts it sells locally. I'll let you guess which is my favorite so far. 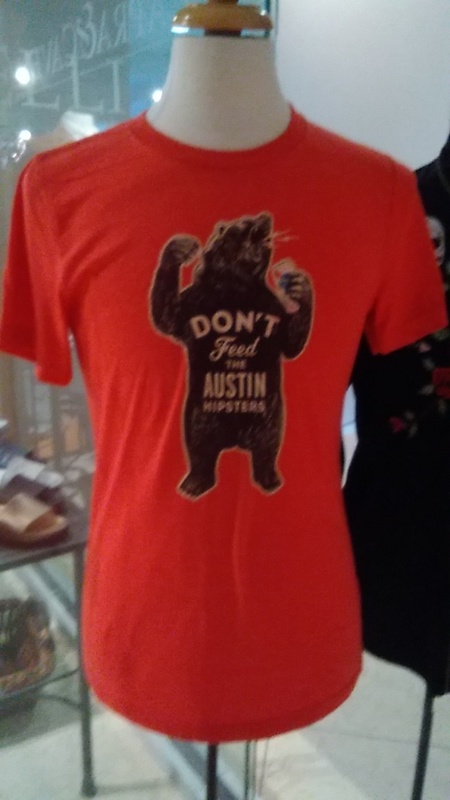 "Don't Feed the Austin Hipsters"
As you surely know, General Convention deals with some complex and sensitive issues. But I want you to know, too, that the tenor within Convention is mostly collegial, good natured, and often full of laughter. I want to share two things with you about the Starbucks in our hotel. First and most important: On the first few days we were here, the temperature was over 100 degrees. As I stood at Starbucks, waiting to get my latte, I saw some people getting their orders. Some were in filthy, shredded clothes. Some looked pretty "down and out." I stood with them at the end of the bar, awaiting my order. I saw the Starbucks baristas hand them large cups of ice water, saying, "Your grande ice water, ma'am," or "Here's your tall ice water, sir." As far as I could tell, these people didn't go through the line and pay money. Starbucks was just giving them the ice water they had requested. That's the sort of thing Jesus would have done, had he run a Starbucks store. It made me proud to be one of their patrons. I seem to recall that Jesus said something about those who give a cup of water in his name. Second: General Convention seems to run on caffeine. Regardless of the hour, there seem to be many Episcopalians getting coffee from the Starbucks in our hotel. I've been here since Monday night. Starting Wednesday, on the register readout, I saw this line: "10% Episcopalian." "YO!" said I to myself, "I'm way more than 10% Episcopalian!" Then I realized that, for some reason, Starbucks is giving all us Episcopalians a 10% discount. That's kinda cool. 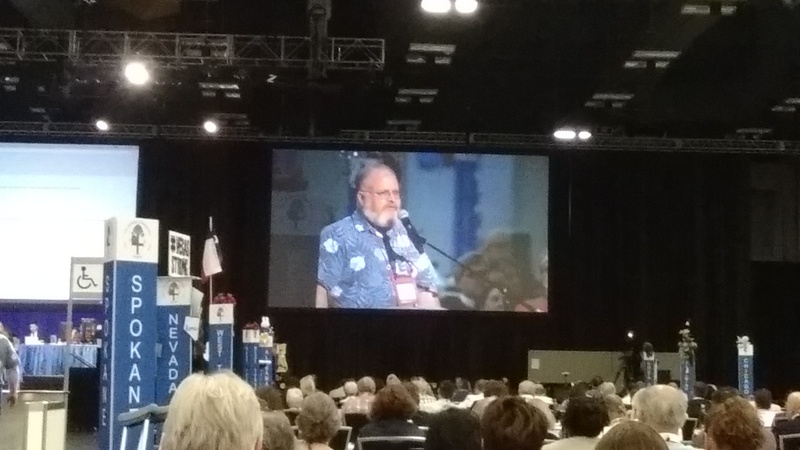 Day two of General Convention started for me with hearings for the Legislative Committee on Ecumenical and Interfaith Relations. We covered some really interesting issues, chief of which was meeting with a delegation from the UMC (United Methodist Church). 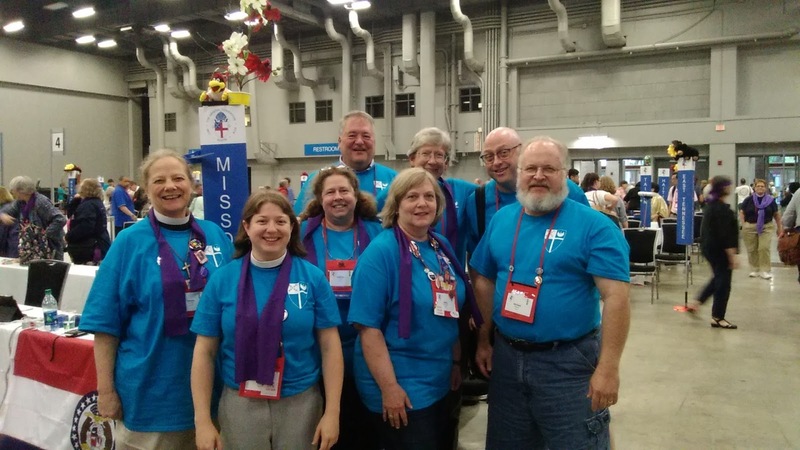 Our committee has several members who have been active with the UMC in talks about full communion. It looks like we may…I hope…have an agreement to bring to the General Convention in 2021. The committee I’m on has the capacity for some levity, and our discussions with the UMC devolved, for a while, into a light-hearted digression about the merits of wine versus grape juice. There was a special joint (Bishops and Deputies) session about racial reconciliation. The presenters were a poet, a “dreamer” priest, a former skinhead, and the director of the Absalom Jones Center in Atlanta. That was the first of three special sessions that will reflect the Presiding Bishop’s priorities of racial reconciliation, care for creation, and evangelism. In the late afternoon we went into legislative session and started discussion of one of the BIG issues of this General Convention – possible revision of the Book of Common Prayer. We got off to a clumsy start when we spent half an hour debating allowing an hour for debate. After that, there were many people who spoke for and against the Resolution, and we didn’t even get to possible amendments. I did get my face on the Jumbotron when I queued in to talk about whether translations were happening quickly enough for our Deputies who don’t have English as their first language. (Sometimes we get in a hurry and vote on things before they've been translated.) Protip: The Jumbotron adds 800 pounds. Today (Thursday the 5th of July) is the first official day of General Convention. Austin has cooled down for the moment, maxing out at 92 instead of 102. 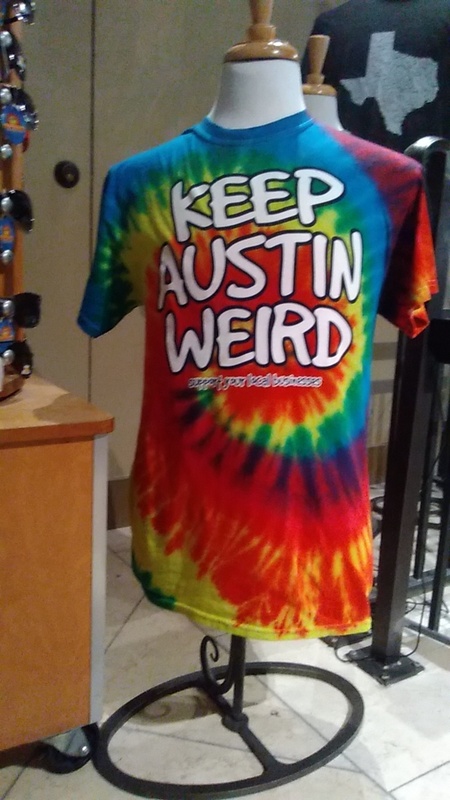 I came to Austin with several objectives. Among which were: To help advance the work of the Gospel. To help the Episcopal Church grow. To endeavor to reach across the aisle and listen to those who differ from me about how to fulfill objectives (1) and (2). To sustain and discover friendships. And to score some Episcopalian swag. I made progress on the latter, while we had a lunch break today. I decided to shop in the Exhibitor's gallery rather than eat. BTW, I do hope you understand this post is mostly tongue in cheek! Mostly, I just wanted to show off my swag. I hope many of you are already aware of the @GC79Pigeon. 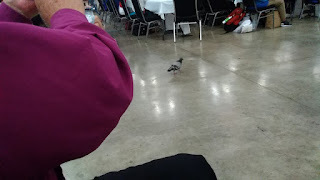 First she flew around in the rafters, then she tried to dive bomb Presiding Bishop Curry during his address to the joint sessions of Bishops and Deputies. But what she really wanted was quality time with our Bishop Wayne Smith, whose sleeve is in this photo, as she walked away. Two of the things I love best about General Convention are seeing dear friends whom I don't often get to see and meeting fellow Episcopalians whom I have previously only "met" in cyberspace. Here are a couple of minor reflections. On my first morning here in Austin, I made my way downstairs to partake of what we jokingly call the "8th sacrament": coffee at Starbucks in our hotel lobby. As I approached, I noticed a crowd surrounding someone. At first, I thought it must be some rock star or other celebrity. Well, I suppose it was a celebrity, albeit of the liturgical variety. It was our Presiding Bishop Curry, surrounded by several people. As I passed by, I heard them expressing their thanks and respect. He seemed to be his usual gracious and ebullient self. Within my first 24 hours here, I had received more hugs than I usually receive in a week, as I encountered friends I so seldom see. Some of you have heard me refer to General Convention as our Big Fat Episcopal Family Reunion. It truly feels like that. Like the other Missouri Deputies, I've been sufficiently busy that I haven't had a chance to post much. In the post earlier today, Deputy Booker talked about attending the Leadership Training session on Tuesday, July 3. I was there, too, and I agree with Michael that the commissioning liturgy was quite moving and the prayers were powerful. 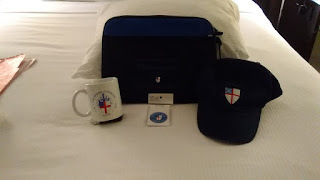 Tomorrow (July 5th) is the first official day of the 79th General Convention of the Episcopal Church, but things have already started yesterday and today. I was a visitor six years ago in Indianapolis, and an official deputy three years ago in Salt Lake City. This time around, General Convention is in Austin, Texas, and I’m a deputy and also secretary to the Legislative Committee on Ecumenical and Interfaith Relations. I safely made the 815 mile drive from Jefferson City to Austin, arriving late Monday afternoon. Last night I had dinner with five other members of the committee on certification of minutes. I'm assistant secretary on that committee. Our own Luke Jernagan is secretary, but he only arrived today. We had a great time getting acquainted, coming from all corners of the US. This morning, I attended the training session for legislative committee secretaries. Then I had time to register as a Deputy and get my credentials and iPad. They say this will be a paperless convention. I hope I can easily make the transition from my Android tablet to the iPad. At registration, I encountered Deputy Bowersox. Together we went to the hall where the House of Deputies will meet. As you can see, it's a gigantic space. I'm standing here where the Missouri deputies will sit for the next 10 days. Beth Felice, Communications Director, email, @bfelice, 314-398-2209 cell and text.